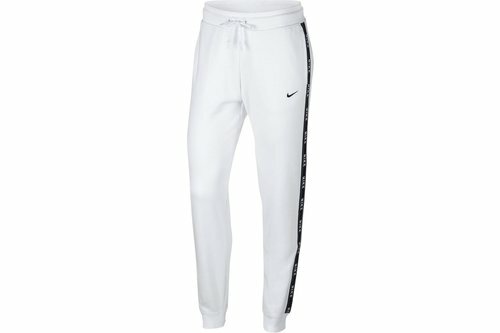 For all-day comfort and a matching workout range wear these Nike Logo Tape Ladies Jogging Pants in White with the logo tape tee now. These Nike jogging pants are crafted with an elasticated waistband and drawstring fastening. They are designed with ribbed cuffs for comfort and 2 pockets for storing essentials. These joggers feature an embroidered logo tape for style, along with a printed logo and are complete with Nike Swoosh branding.